The Esqueleto Explosivo slot machine by Thunderkick is a homage to all things autumnal in Mexico. 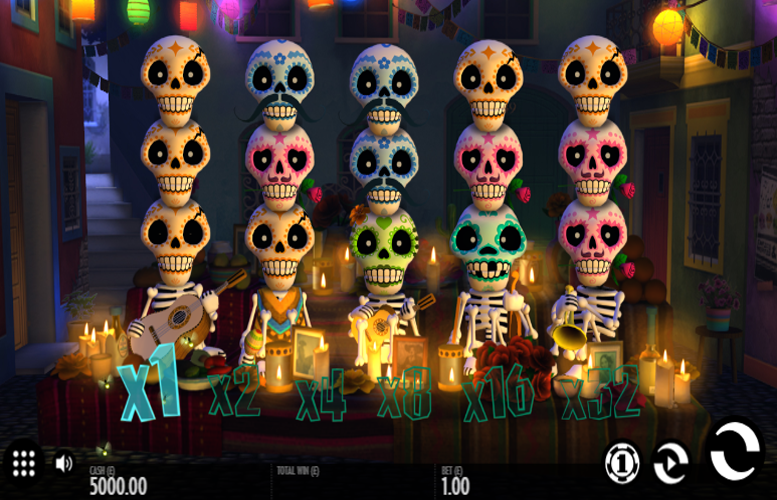 The action focuses around the world-renowned holiday, Día de Muertos, and comes complete with typical skulls and a few interesting bonus features – we particularly love the massive 32x multiplier on offer! In terms of the slot machine’s design features, players spin symbols across a five reel, three row grid. There is a total of 17 win lines along which symbols are matched to create winning combinations. Players who appreciate slots with strong imagery and simplistic gameplay features will likely enjoy Esqueleto Explosivo. Let’s look closer at the title already! Potentially massive bonus wins. A 32x multiplier can really boost your prizes! We approve. Great slot design. The artwork and soundtrack make for a game with a strong feel that is appropriate for the theme. Not a lot of variety when it comes to bonus features. We really like the multiplier “dropping symbols” dynamic but without an additional second screen game, the slot could get old fast. Tiny main game prizes. Esqueleto Explosivo is not the kind of title that you can spin in huge, life-changing sums during the base game! Pink skull = 2.5x the total bet. Green skull = 1.4x the total bet. 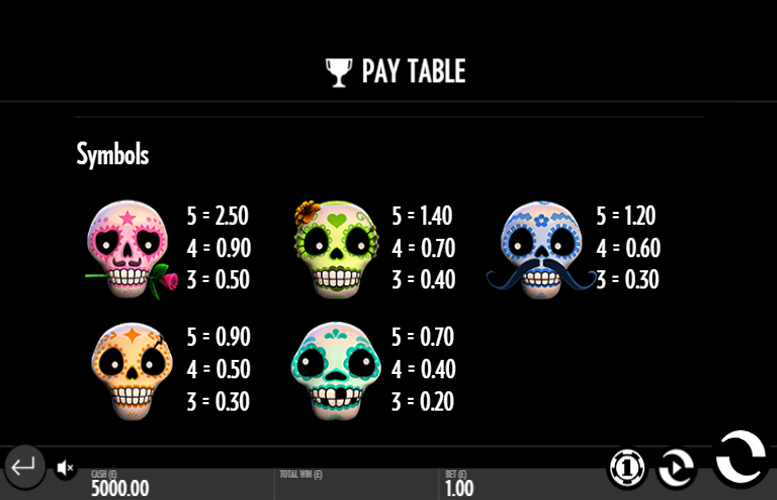 Blue skull = 1.2x the total bet. Orange skull = 0.9x the total bet. Turquoise skull = 0.7x the total bet. The game also operates on a running multiplier with a max of 32x meaning the biggest possible payout is 80x your line bet. 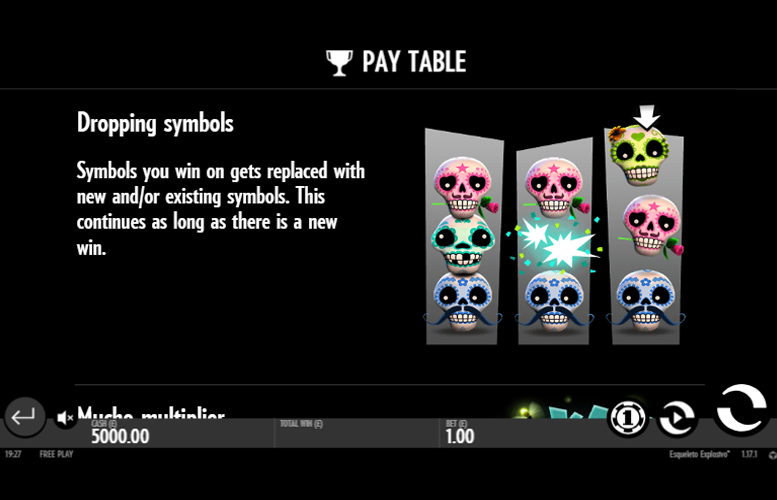 Since the symbols used on the Esqueleto Explosivo slot are all represented by these skulls, we will forgo the usual differentiation between high value and lower value symbols. A full list of payments can be found in the title’s pay table. 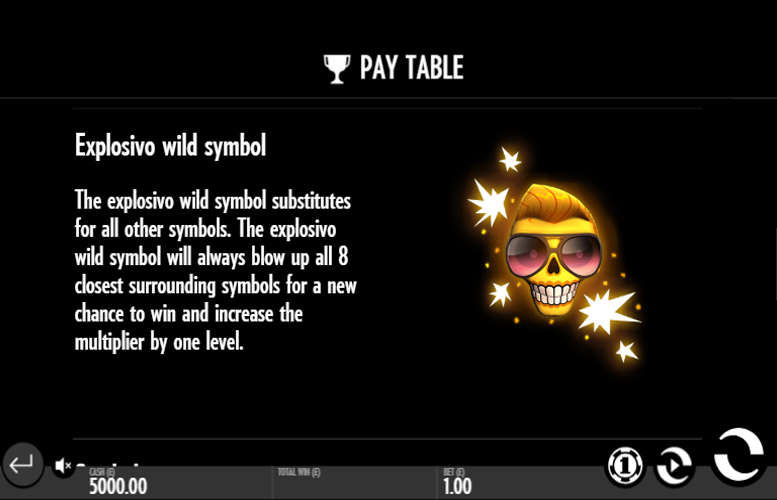 The “Explosivo Wild” symbol will substitute for all other symbols in the game. It will always blow up all eight of the closest surrounding symbols. This gives the player loads of opportunities to win again, as well as increasing the Mucho Multiplier. More on this shortly though. When a player spins in a winning combination, the symbols involved disappear and are replaced with new and/or existing symbols. This dynamic will continue until there are no new winning combinations. 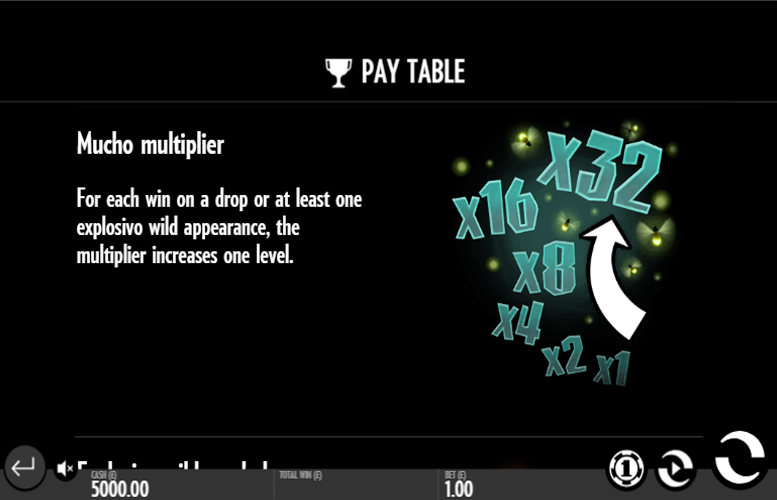 For each win on a drop or when an “Explosivo Wild” appearance, the multiplier at the bottom of the reels will increase one level. The multiplier doubles each time it increases up to a maximum of an impressive 32x! Thunderkick slot machines differ from those of many other developers in that they don’t allow players much scope to vary their bet sizes and distributions. It’s common on other titles for options to be included to alter the number of win lines, as well as the number of coins bet on each one. This is not the case here. Instead, the Esqueleto Explosivo slot machine only features 12 different total bet amounts. They range from a low of just 10p to a maximum value of £100. These betting limits should more than enough to satisfy all but those in command of the very largest bankrolls. To conclude, the Esqueleto Explosivo slot machine is a solid title will some great stylistic touches that really help create a strong look and feel. Of course, this is appropriate for a game that focuses on the holiday Día de Muertos. However, we don’t judge slot machines on their looks alone! We also put their gameplay features through their paces. Whilst there certainly are some interesting additions such as the huge multiplier and exploding “wild” symbol, the combined appeal of these is unlikely enough to get players flocking back for extra spins. We might be wrong though so why not load it up and see for yourself! This game has a rating of 3 / 5 with 362 total reviews by the users.